Michael McFadyen's Scuba Diving - Woodies, Queensland Great Detached Reef is located at the northern end of the Great Barrier Reef off Queensland, Australia. It is about 125 nautical miles (230 kilometres) from Thursday Island in the Cape York area (the pointy tip of Australia) and 75 nm (140 kilometres) from Lockhart River. The is 45 nm (85 kilometres) east-north-east from closest point of the Australian mainland, Cape Grenville. It is just over 4 nm south of Raine Island, the largest green turtle nursery in the world. 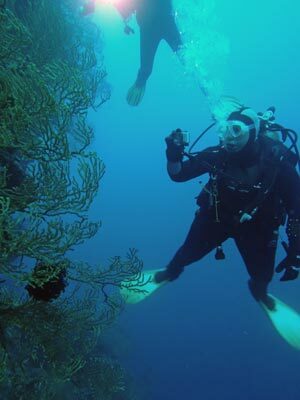 Woodies is located on the western side of Wood Reef which is about 0.7 nautical miles south-west of the south-western corner of Great Detached Reef. 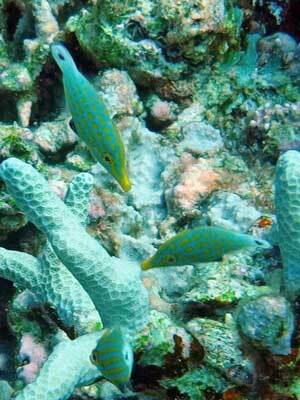 Wood Reef is a triangular shaped reef about 2.5 by 1.5 nautical miles. The longest length runs north-west to south-east. Woodies' location is GPS S11º 47' 27.3" E143º 57' 28.1". 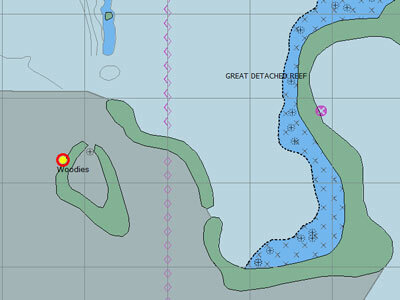 The site is just north of the entrance into the Wood Reef Lagoon (which is not as shown on the chart above). 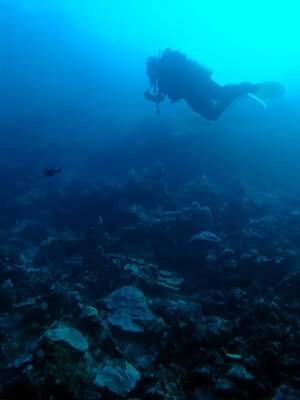 The site is a long finger or reef that runs out about 150 metres from the main reef at a depth of about five metres. It drops off very steeply either side and at the end to over 100 metres. The reef has a tunnel through it almost at the end. This is at 20 metres and runs for about 20 metres through the reef. It is five metres wide and a few metres high. We anchored in about 20 metres on the southern side of the point in towards the main reef. Once in the water we dropped to the bottom as soon as we could see it. Heading west, we swam along at about 25 metres looking for the tunnel. We ended up being a bit too deep. We were told that the tunnel was in a sort of landslide area, two from the boat. It turns out it was more like the fourth one, but we easily found it. This whole section of reef is very spectacular, the shear vertical wall has lots of gorgonias and sea whips. The tunnel is really interesting and you can get some excellent photos looking out and through the tunnel. Once you exit the tunnel, turn left and start dropping. 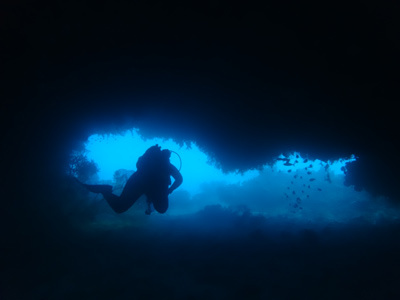 We went to 32 metres as the best gorgonias and sea whips are down deeper. 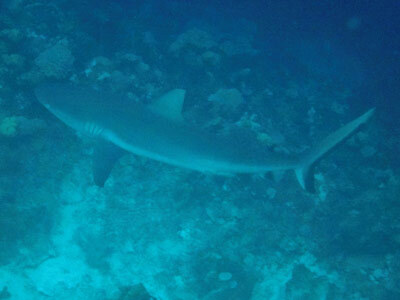 We also saw a large grey whaler and a large silver-tipped reef shark out here. If the current is running (it was not for us), then this point would be an excellent place to see sharks. We headed back to the east, this time on the northern side of the point. There are plenty more gorgonias and sea whips along the way. We gradually came back up to 20 metres and maintained this depth all the rest of the way back. There are two places where you can cross over back to the southern side. One is about two thirds of the way back and the other is right on the main reef. We took this latter one. The channel back to the south side is about three metres deep. We saw a few more small sharks here. Once across, we came back to near the boat and spent the rest of the time in five metres. There is some excellent coral here, with plenty of anemones, clownfish and all the usual species. 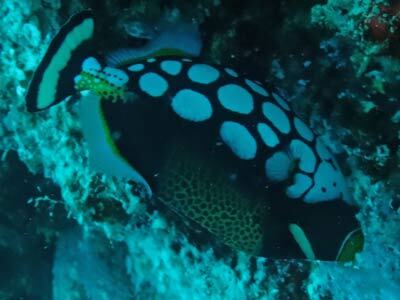 We also saw lots of trevally, surgeonfish, unicornfish and more in the deeper water on this dive.